I’m freaking out. I bought a plane ticket to New Zealand. So what? That’s nothing to freak out about. I know, but I’m planning to hike there. Yeah, of course, New Zealand is a hiker’s dream come true. Well, I’m going to hike the length of New Zealand for 5 months continuously. From Cape Reinga in the north to Bluff in the south, following the Te Araroa Trail. Can you see why I’m freaking out?! Let me take you 1.5 years back in time. I was dreaming of going on a thru hike. That’s hiker’s jargon for going on a very, very long walk (like 3000km on the Te Araroa) in one go. Some of you may have seen the film Wild in which Cheryl Strayed – starred by Reese Witherspoon – hikes part of the Pacific Crest Trail (PCT), one of the most famous thru hikes in the world. Let me point out – and this is important to me – that I’m only mentioning Wild for those of you who don’t know about thru hiking, because it may give you an idea of what the heck I’m going to do. Let me also point out – and this is even more important to me – that I’m not mentioning Wild because I’m part of the new generation hikers affected by the “Wild effect”: The PCT is getting overcrowded because people watched Wild and thought “hey, let’s do this”. Honesty, I’m wondering: who are these people? Yes, I was inspired by the beautiful nature of the PCT, but I already liked hiking – thank God, because seeing Reese (aka Cheryl) suffering with her way too heavy backpack didn’t make me feel like “hey, hiking is fun”. She even lost her toe nail, for God’s sake! I can’t exactly pinpoint the origin of my desire for thru-hiking. It’s not that I have unresolved issues…. Well, of course I have unresolved issues – who doesn’t? – but not the kind of issues that make me want to escape from normal life into trail life, like Cheryl Strayed in Wild had (e.g. divorced, addicted, and the death or her mother). I wouldn’t complain though if this thru hike helps me overcome some insecurities, but it’s not the main reason. When I started to hike 5 years ago, I fell in love. Like every love story, it’s difficult to explain why. Yeah, the guy is good-looking, and funny, and intelligent, but they’re hundreds of handsome, smart men with a good sense of humor. It’s butterflies in your stomach and a racing heart. It’s a feeling! When hiking, I feel amazing. The remoteness of some places – knowing that you can only come here by foot – in combination with the beauty of wild nature touches me every time. Hiking also brings me a sense of calmness that I’m not used to. Unfortunately this reminds me that my normal state of being is rather agitated than relaxed. Hopefully thru hiking will force me to live in the now and take things how they come. Mostly, I’m just longing for a big adventure and like to push my limits. Partly, that’s also why I’m doing this alone. People are often surprised about that, especially because I’m in a long-term relationship. I sometimes felt a bit offended about all the questions and remarkable comments about travelling alone while having a boyfriend. Yes, if you might wonder, it would be amazing to share such an experience with him. But I’m also convinced that it would be very good to do this on my own. If we hike together, I always find myself leaning on him. Alone, I will have to make all the decisions myself and have to face all the challenges myself. Frankly, I didn’t want to have a bigger challenge than doing such a long hike by myself and therefore decided that I wasn’t up for the snakes and bears on American thru hikes. Europe felt too closeby, and the Himalayan mountains are not always safe for women alone and probably ask for more mountaineering experience. Apart from that, I’ve always heard amazing stories about New Zealand, mostly about the South Island. At first I only wanted to hike the South Island as I figured it would give me the wilderness experience I was looking for, but then I started reading. Even though the Te Araroa (Maori for “the long pathway”) trail has quite some road walking in the North Island and often leads you into villages instead of in remote wilderness, that could also be an opportunity to meet the people, learn about the culture and explore the north island. Let’s do this! 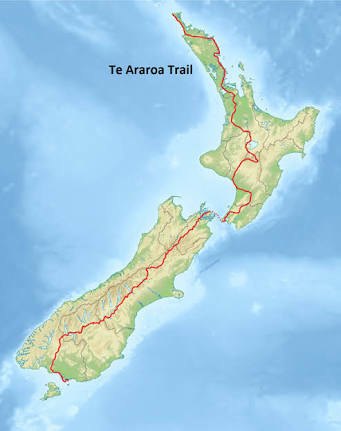 The Te Araroa starts at Cape Reinga in the top of the North Island- a very spiritual place where the Maori spirits of the deaths pass on their way to afterlife – and ends after 3000km in Bluff, at the bottom of South Island. Mooi geschreven! Ik kan jouw overwegingen helemaal begrijpen. Heel veel succes! Looking forward to follow this great adventure. Wat heb je dat mooi verwoord. Ik snap precies wat je bedoelt. Heel veel plezier. this is so inspirational and ambitious! I can’t wait to follow your journey!